Department of Burns, Plastic and Aesthetic Surgery, Multi-profile Hospital for Active Treatment – Varna, Military Medical Academy – Sofia, Bulgaria. This paper presents 11 clinical cases with soft tissue defect of lower leg and foot. The reconstructive surgery of the wounds involves 14 pedicle flaps: five of which are gastrocnemius; nine are sural flaps. The etiology of the defects is various: 6 of the patients are with deep burns of the lower limbs; 3 with deep frostbite; 2 with different trauma. The patients are aged between 27 and 79. The obtained results and the applied reconstructive methods in the treatment of soft tissue defects of the lower extremities are discussed. Key words: flap, burns, foot, lower leg. Zayakova YK. APPLICATION OF PEDICLE FLAPS FOR WOUND COVERAGE OF LOWER LEG. J of IMAB. 2013; 19(1):382-386. 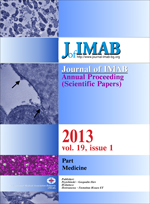 DOI: 10.5272/jimab.2013191.382. Correspondence to: Dr.Yolanda Zayakova, Department of Burns, Plastic and Aesthetic Surgery, Multi-profile Hospital for Active Treatment - Varna, Bulgaria. 17. Romansky R, Dimov V, Milev S, Minkov G, Arguirova M, Laftsis A. Application of distally based sural flap for defect coverage of the lower leg and foot. Bul J Ortop Trauma. 2011, 48(1):30-38.